The piece is situated in one of two lobbies that form the ship's complete cross-section, where six elevator bays rise over 16 decks, and several flows of people converge. The experience it offers is relative to the speed and vantage point from which it is received -- looking up while waiting for the elevator; looking out from a contemplative position on any of the decks above; or as a dynamic view from inside an elevator as it either lifts or lowers. The design of Tour de Force(s) and the intensity of its fluorescence aim for the same objective as the cruise vacation itself: to remove a person from his or her familiar, everyday life, and place them somewhere out of the ordinary. Physically expressing the forces and movement of the ship's nevralgique axis, Tour de Force(s) is designed and generated through tension. A generic mesh is anchored at 23 fixed points and submitted to physical forces, resulting in a 3D curvilinear perimeter. As the piece rises through the spine of the lobby, expressing tensile forces along the way, a juxtaposition is revealed between each side's accent color: bright neon yellow on the front, deep blue on the back. The play on the curvature of the surfaces varies perception, allowing sometimes only the blue side to be seen, sometimes only the yellow, and sometimes both. Assembly of the piece required the logistical cutting, organization and shipment of 10,813 parts. Once all were cut and painted, they were pre-assembled into 47 sections, each approximately 1m x 1.25m x 2m in volume, packaged and shipped to site. There, a crew of four plus one specialized high-altitude rigger assembled the piece in 4 days. 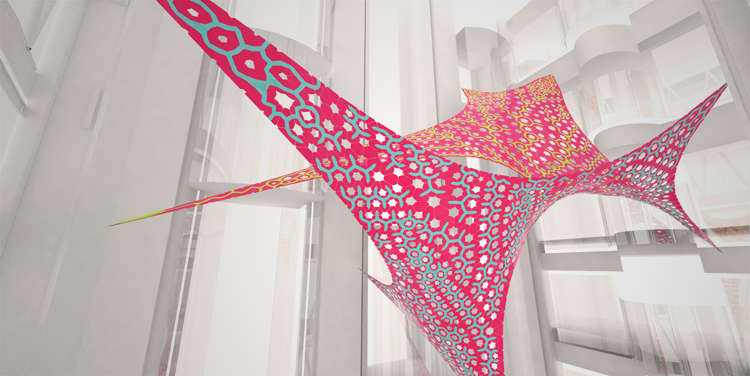 Tour de Force(s) is conceived as more of a scalable architectural skin than as an artwork, which could easily be assumed of a piece hanging within a large void. Fully in tension in its final stage, the aluminum does not necessarily require such a thickness. Artificially thickening it, however, provides resistance to the transportation and fast-paced manipulation by marine riggers in the ship's atrium -- distinguishing such a skin from a temporary installation piece. The descriptive geometry of the piece is collected by a series of distributed agents crawling on its surface. Beginning from seeds, they conquer in a branching and recombining manner to generate trails, which become physical parts. Each the yellow and the blue layer have a different type of behavior. The way by which Tour de Force(s) several thousand parts work together can be understood as the blue and yellow parts connecting pink parts, or conversely as the pink connecting the blue and yellow parts. All three create a composite multi-layer system, which, due to the slight give between parts, is able to assume the described double curvature without the need for cold bending or folds. The three-layer composite finish includes first an application of powder-coating to provide resistance to corrosion, a second layer of liquid paint for the bright color, and last, a layer of transparent varnish for the best protection of the fluorescent effect. By visually wandering the surface, following the connector network with their eyes, visitors may start to wander too with their mind: Where does it start? What is the seed of branching? Are there multiple seeds? How does it end?